Wind Tunnel Models. We design models and components suitable for wind tunnel tests. Our experience in creating engineering models for the oil and gas industry dates back to the British Gas Armada Platform in 1993. Today, we 'print out' our CAD models on advanced additive-manufacturing machines (3D printers). 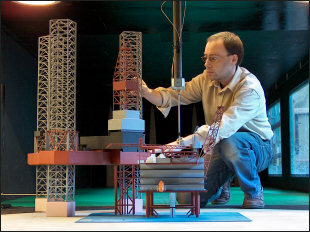 Gas Explosion Models. We also design CFD gas explosion simulations. Explosion modelling provides the ability to anticipate potential consequences from accidental industrial gas explosions and hence take mitigating measures. Armada employs sophisticated CAD software to generate geometrically accurate models for use in our CFD explosion simulations. 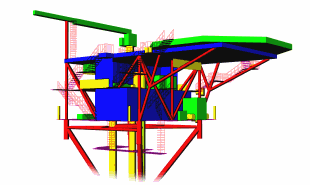 Explosion modelling also provides an excellent analysis tool for accident investigation. The video embedded in this page illustrates a typical CFD explosion simulation conducted by Armada. Situated within the engine room of an offshore platform, it involves a stoichiometric concentration of methane in air. The animation covers the time period from 0.278 to 0.448 seconds after ignition and has been slowed down by a factor of approximately 100. Over-pressures are plotted between 0.1 bar (blue) and 2.0 bar (red). Some platform geometry has been made transparent to facilitate overpressure visualization. Coordination of Wind Tunnel Studies. Within Armada there is wind tunnel testing experience spanning 15 years, which allows us to provide a complete management package for wind tunnel studies - from initial quote to final report. Relax as everything is coordinated in a seamless fashion. Customer review at the critical stages ensures a timely conclusion to the project. On-site measurements. In addition to wind tunnel studies, Armada also has project staff experienced in recording, processing and reporting on data relating to on-site wind-environment studies.